The 9.30pm news tonight has reported that Tulip Garden is relaunching their collective sale. The reserve price is slashed to $600 million, down from $650 million previously. 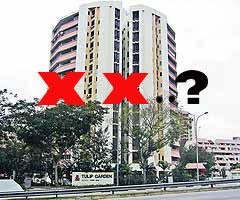 The last tender, which was also the second attempt by Tulip Garden to go en bloc, was launched back in December 2010. However, there was no taker then. Looks like the owners of Tulip Garden are not about to wait till the next "up" cycle to sell their estate. So what's next.... Pine Grove having another go at $1.4 - $1.5 billion maybe? We will update this post tomorrow if there are further details. Tulip Garden has re-launched its collective sale, after its last unsuccessful tender exercise that closed in January this year. Credo Real Estate, which is handling the sale, said the owners of the 164-unit development are asking a minimum $600 million, down from the previous price of $650 million. Credo said the majority of the owners present at an extraordinary general meeting last month voted in favour of seeking a written mandate from at least 80% of the owners to lower the reserve price. Credo added while the process is still ongoing, the collective sale committee has decided to relaunch the tender exercise. At an asking price of $600 million, developers are looking at an effective land cost of about $1,153psf ppr, based on the allowable plot ratio of 1.6425. Should the developer choose to maximise the potential 10 per cent allowable space for balconies, the effective land cost could be lowered to $1,118psf ppr, after factoring in development charge of some $23 million. Tulip Garden has a total gross floor area of about 557,400sqft, which includes the additional 10% balcony. The development can potentially yield about 400 apartments, with an average size of 1,325sqft, depending on layout. Tulip Garden is located at the corner of Holland Road and Farrer Road in the prime district 10 area. The tender closes on July 19. No Comment to " Enbloc News: Third Try for Tulip Garden (Updated) "